Hope you all had a lovely week – guess what its just 3 weeks to the end on 2016!! Can you believe it?! I sure can’t as this year has gone by so quick… so many things to do and so less time!! Speaking of masala dabbas, I know this is by far, the most important thing in an Indian kitchen, however if you are not from South Asia then I would like to know if you own one yourself? 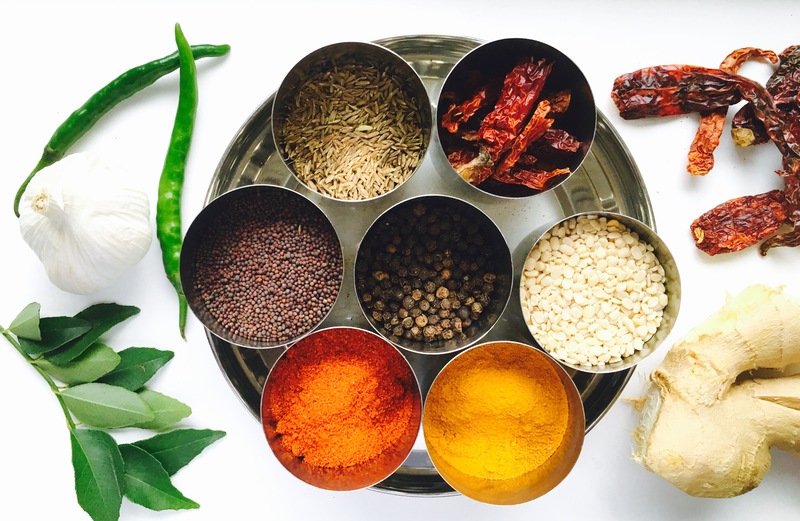 Tempering your Indian dishes with a combination of any of these spices is paramount to achieving the authentic taste, as Indian cooking is very much about attaining a keen sense of aromatics. Black/ Brown Mustard Seeds: No South Indian kitchen in complete without mustard seeds! Best used while tempering a sambar or curry. Turmeric Powder: An essential ingredient in most Indian cooking, adds an earthy flavour, with slight bitterness and lots of colour. Remember not to add too much turmeric as it will turn your dish bitter! Fresh Curry Leaves: This is a distinctly South Indian ingredient, no kitchen is complete without fresh curry leaves. Most homes in the south have a home-grown curry leaf tree that one would directly harvest leaves for a South Indian tadka! Missing my maternal home just by the thought of it!! Fresh Garlic: I love garlic in most things, this is the only optional ingredient on my list, but takes the flavour up by several notches every time! In South India, some of us use it and some of us don’t. While tempering, I tend to use a combination of at least 8 of these 12 ingredients, this in my opinion is what makes a dish authentically South Indian. Remember its all about the aromatics!